John Cena and Redefining Titles in the WWE. At first I hated the idea of John Cena winning the World Title. Not only did I think he was coming back too early, I could not see the point of John Cena having the World Title, since the World Title has been the #2 title for a few years now. I did not see the point. Once I saw John Cena beat Damien Sandow I had a different idea. After seeing John Cena fend off a Money in the Bank cash in I realized that John Cena should hold the World Title for the next 36 months. This could be the first step in the WWE refining their men's singles titles. Right now the WWE has real problems in the mid-card. They do a great job introducing wrestlers and they do a good job telling stories at the top of the card. They do not do such a great telling stories in the middle of the card. One of the problems they have is knowing what to do with the mid-card title. Right now the World Title is well defined at the secondary title, but the US Title and Intercontinental Title are not valued, they are not used in interesting stories and they are not given consistence places on the Pay-Per-Views. For a while I have heard many people say the WWE has too many titles. It is hard book four titles in their current format. People what the two top title and the two mid-card titles to be "Unified" to go back to the era of two singles titles. The logic is retiring title will make the other titles important. The problem is that both the US Title and Intercontinental Title have a ton of nostalgia attached to them. As many times people try to send them away, they keep on popping up. Maybe you can take the World Title off the board by doing something more interesting with it than retiring it. Maybe putting the title on John Cena for a long period of time can redefine the lower titles and give mid-carders a reason to wrestle John Cena. For a long time the narrative about titles is they are a ladder to be climbed. You need to hit each rung to get up the ladder. The problem with that narrative, it does not give anyone who is not wrestling for a title any story motivation. Lets leave the World Title on John Cena. Lets increase the profile of the IC title and make it the title you hold while you wait for a chance at the WWE title. Make the US title the title for people who have been on TV less than three years. 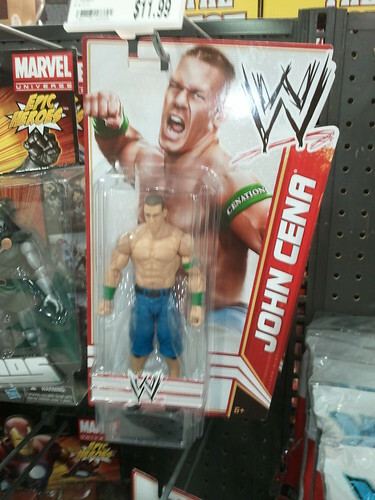 The people who wrestle John Cena are not on the WWE title track. Either people who lost the WWE title or people who are just out of the mix, like Jack Swagger, R-Truth, Christian, Kane, or Wade Barrett. Even if there is no chance John Cena could lose the title, interesting stories could be told. Most of all it is happening outside the pipeline to the WWE title. You can do this and still have the WWE title as the top title in the company. You can put the top wrestlers in the WWE title hunt without being overshadowed by John Cena at the top of the card.